The information below is how I fit bridles and how I was trained to do so by the Traditional Saddler who taught me.I also give some advice on bit sizes and styles of bit rings as well as how to fit a flash lower strap. Some times you buy what you will think will fit, like a cob size bridle for instance and your “cob” is in between sizes! Also, you need to know that each manufacturer or saddler who makes bridlework may have his or her own ideas of measurements and what fits what, no two saddlers can ever agree which is right, believe me! This seems to happen because the old measurements for bridlework like the ones I have, would have suited equine breeds/types that were in favour 50 years or more ago, equines have got finer or chunkier depending on breed/type so what may have fitted a heavy cob 40 years ago may not fit it now using the old measurements. I have my own measurements which are at least 50 years old or more plus I have newer up to date measurements in books and they vary GREATLY. As well as this problem, the measurements today of Pony, Cob, Full or Extra Full you see in the shops on bridles that are massed produced by large companies can cover a lot of different sizes or shapes and at its best is somewhat vague in its description of sizing. When trying on new bridlework to determine if it fits DON’T do up any buckles or hook studs, simply and GENTLY push the ends/tips of the straps through the running loops by about an inch or less (loops are sometimes called keepers, running loops are the loops that run freely up and down the strap).By doing this it enables you to offer up the bridle and keep it in place whilst you decide if it fits or not without marking the leather so it can be returned in a good re-sellable condition to the saddler or retailer without complaint from them.When hook studs are fitted to bridles on the ends of the cheeks and reins, push the end of the strap through the fixed loop (non moving loop) furthest away from the bit. DON’T let any of the straps bend up in the middle as you apply pressure, this can be avoided by holding the strap as close to the end as possible. Whatever you do DON’T put the strap through a buckle or a hook stud and do it up properly or you will crease the leather. 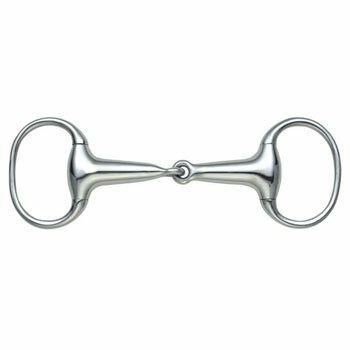 Traditionally fingers are used to measure all Saddlery when fitting them on the horse or pony in this we mean an average man’s finger, not a child’s or ladies finger. * You should as a rule be able to fit 1 finger comfortably under the browband. * 2 fingers under the noseband (cavesson variety) or 1 finger under a grackle, flash or drop variety or any other kind that acts to close the mouth. * Allow a distance of 2-3 fingers from cheek bone to top of noseband. * 1 finger under the headpiece at the poll. * 3 fingers under the throatlash. * All buckles should be done up on the middle hole (all good bridles will have a uneven number of holes to enable you to do this) and they should line up with the horse’s eyes on the cheeks, noseband cheek and throatlash. This is the correct way but longer cheeks than mentioned are used as long as they are not right up to the end hole as so often seen! * IF the browband is too short it will have the effect of pulling the headpiece up against the back of the horse’s ears and is the most common cause of head shaking yet it is largely unknown and always over looked! * PROPERLY made bridles are made with bridle pointed ends (shape of end of straps) NOT egg pointed (as used on show bridles, headcollars and harness bridles) shaped ends like this are used on cheaply made bridles that are massed produced using machinery. Bits of the Eggbutt variety need to have no more than 1/4" protruding out from each side of the mouth and DOESN'T really need bit guards as this type of bit can't really pinch the lips unless it's very roughly handled by the rider. Answer to that is improve your riding, balance and hands. Loose ring variety bits need 1/2" protruding out from each side of the mouth and SHOULD have bit guards as these type of bits can pinch the mouth. A Bit correctly positioned in the mouth should produce no more than 3 wrinkles at the corners of the mouth, what we know as "the little smile"
The little smile showing a correctly placed & sized Bit that is designed to be used with leather gag cheeks rather than leather flat cheek pieces! Bridlework including Bits need to fit correctly as much as the saddle but is often neglected. 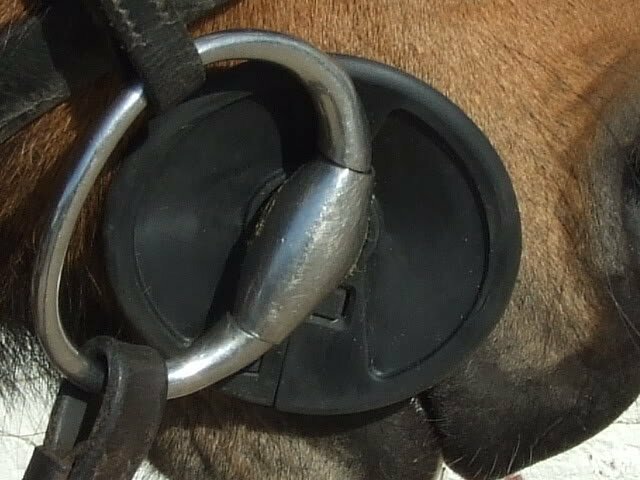 How often do you see nosebands too low, tight or buckles right up on the top hole and my MAIN gripe is a lower flash strap pointing the WRONG way! Bits too large pulling through the horse's mouth or too small and pinching. ALL straps on bridles need to be pointing towards the rear of the horse and/or downwards (apart from cheek billets) and not as I see so often with flash straps pointing forwards and the loose end tucked into the flash loop on the nose band itself!! 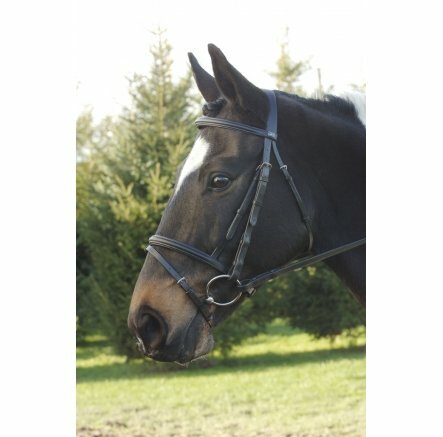 Below are examples of good and bad fitted bridles. 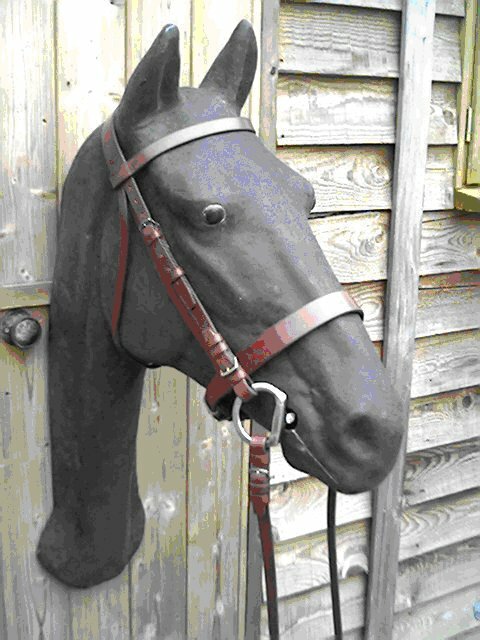 Not a great photo as low pixel camera but you can see the buckles on the cheeks are lined up with the eye, in fact the cheek piece could come down slightly, the noseband is in correct place as is the browband.This is a cob size (old measurements) bridle in the Hunter Snaffle style I was making in 1987 when I trained.The bridle is hand made, using buckled up billets on cheeks and reins and has bridlepointed ends.The model head it is on is full size yet it is a good fit in most places, it just shows you the problem in finding the right size when you are presented with Cob or Full. I think cobs, in general, must have been bigger in those days! This bridle above has hook stud billeted ends. It has egg pointed (shape) ends of straps, shown on massed produced cheaply/quickly made bridles.Even if you pay A LOT of money for this sort of bridle as with this one above, traditionally it is wrong, it should have bridle points (shape) on the ends of the straps which is a blunted end. Everything is made quickly today though isn't it, they can use a metal punch to punch this end shape out rather than cut the bridle points by hand. The flash lower strap is in the right place and facing the RIGHT way.The buckles aren't quite lined up right next to the eye but it is hard to get it exactly right.Should also have bit guards on the bit to stop any possible pinching of the horse's lips. Correctly fitted lower flash noseband strap facing the right way, note it has egg pointed ends though! Incorrectly fitted flash lower strap facing upwards when it should be facing downwards. 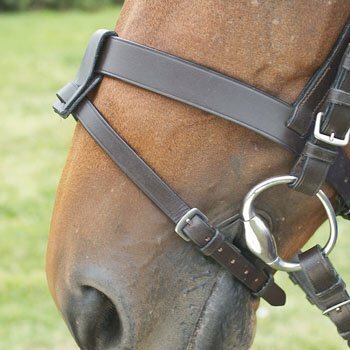 It's not just that it looks wrong, when facing upwards the strap can get caught on anything the horse rubs it's face on or walks near to which can catch the end of the strap and rip off the loops and undo the buckle, it is a safety issue.When the strap is facing downwards it cannot be undone very easily by the horse. Note this bridle has cheeks are too long, in fact the whole bridle is too large for this horse. The cheek straps coming down off the headpiece actually overlap the billets of the cheek pieces that are attached to the Bit. 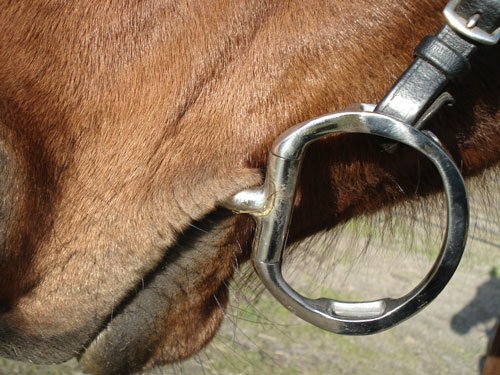 All buckles should be as near to the middle hole as possible, NOT right at the top as on this bridle.It has an awful comfort headpiece which has a weakened area by it's very design and in my opinion should be banned! 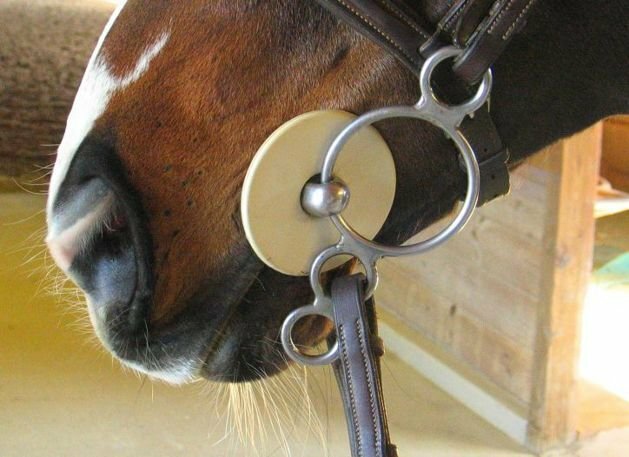 The bit should have bit guards to protect the horse's lips from possible pinching. It's ONLY saving grace is, it has bridle pointed ends (shape of end of straps) which is traditional. Incorrectly fitted rubber bit guards, it is an eggbutt variety snaffle bit, it DOESN'T NEED any bit guards and will be making the bit too small for the horse's mouth! Correctly fitted rubber bit guards, it stops the bit ring pinching the lips and the bit is the right size for the horse's mouth.This horse will be far more comfortable with his mouth arrangements than the one above it, I can guarantee you that! 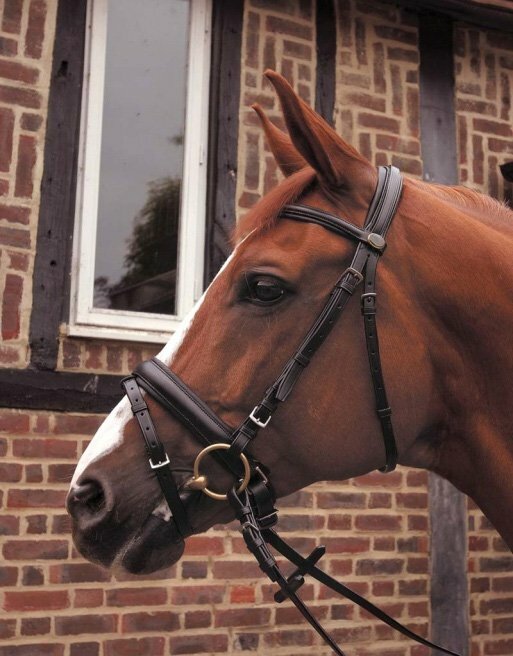 Since writing this article I have been asked about people's bridles and if they fit or not, if you have any doubts about your bridle fitting your horse, tack up and send me some good quality side view photos to Austin@unicornleather.co.uk and I will see if I can advise you on it's fitting.